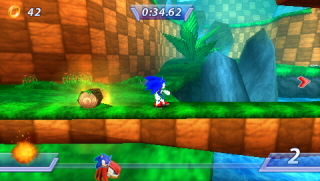 Forest Falls Zone is the opening level of Sonic Rivals for the PSP. A Green-Hill-styled area with chequered soil and waterfalls, the Zone contains two Acts plus a boss fight at the end. As with most of Sonic Rivals, the Zone is located on Onyx Island: which is Angel Island from the future, warped to Sonic's time by Eggman Nega. Not quite as tropical as Green Hill Zone itself, Forest Falls nonetheless sports a temperate climate, with green grass and colourful flowers all over the place. Leafy deciduous trees take the place of the original's palms, and the multitude of raging waterfalls can lead into dim, underground caverns within the purple rockfaces, where giant spiderwebs abound. Players can take to the air, riding the winds on giant leaves, and ponds down below sport oversized water lilies to hop across. The various intertwining journeys of the four playable story characters all start off in Forest Falls Zone. Shadow receives a cryptic call from Doctor Robotnik, asking him to follow the transmission's signal. Ending up in Forest Falls, Shadow spots Silver the Hedgehog apparently pursuing "Eggman", and sets off to stop him. According to the manual, Silver is suffering from partial amnesia on account of whatever method he used to travel back in time; as the game progresses, he becomes more confident of his mission and his faculties. Knuckles, meanwhile, is searching for the (once again) missing Master Emerald, and his hunt brings him to the strangely familiar Onyx Island. Running into "Eggman", Knuckles openly accuses him of stealing the Emerald, to which the fat scientist shamelessly confesses. Before Knuckles can lay the smackdown, Sonic arrives, demanding to know what "Eggman" has done to Amy and Tails. The Doctor explains that he used his special camera to convert the Master Emerald and Sonic's allies into cards - and if the echidna or the hedgehog want any of them back, they'll have to catch him first! Forest Falls concept art, as "Waterfall Forest"
This page was last edited on 6 March 2018, at 00:03.